Joyce Wycoff Connecting through Art: Why This Moment? I just checked ... it's now 2011 in Rio. 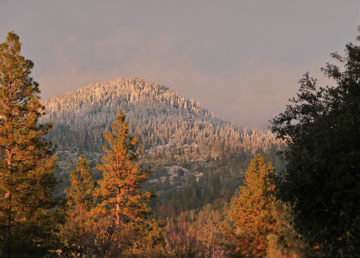 Here in the Sierra foothills we have 5 1/2 hours left of 2010. What a funny way to think about things. As if all the minutes of 2010 were painted purple and the first minute of 2011 turned time pink. There is no real difference between 11:59 pm today and 12:00 am tomorrow but bells will ring, fireworks will rocket, and a glittering ball will mark the moment for millions of people. Why do we take this drop from the ocean and hold it up as if it were a rock star? Not one thing is different from one moment to the next and yet instantly a million diets will be launched, exercise gym memberships will spike, and nicotine patches will fly off the shelves. Slates will be wiped clean, do-overs will multiply like bunnies and hope will blossom in the universal heart. Perhaps the question isn't "Why do we celebrate this one moment?" but rather "Why don't we celebrate every moment?" Why can't we start afresh every moment? Wipe away the dust and grime of the past and open our hearts to hope and joy every single second of every new and glorious day? Why not indeed! May every moment of the coming year be filled with joy and a great forgetting of all past hurts and wrongdoings. Great blog to read this morning. Love the photo! Wow! and the great forgetting. How lovely! Happy New Year my dear friend. May your year unfold in joy and laughter spreading abundance and grace throughout your life. It's interesting how many posts I've read this morning that begin by saying this will not be a year for resolutions. I agree with you: why not indeed!